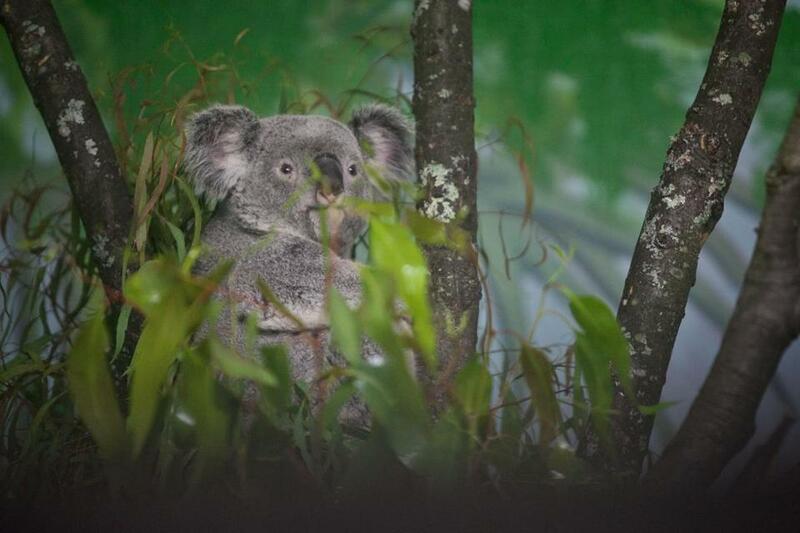 Thackory, a 2-year old male koala, sat in his tree at the Stone Zoo in Stoneham. Animal enthusiasts now have the chance to interact with Australian budgies, hear the grainy whine of a tawny frogmouth, and watch koalas snacking on eucalyptus leaves at Stone Zoo’s Aussie Adventure exhibit, which opened last Saturday in Stoneham. The zoo is hosting these species until Sept. 2 to allow visitors to get an up-close look at creatures they might not otherwise encounter. In the case of the budgies, zoo-goers will get to do more than just watch. Guests will be able to roam the indoor exhibit among these colorful parakeets and feed them with seed sticks that will be available for purchase. Summer residents at the Stone Zoo’s Aussie Adventure include koalas, red-necked wallabies, and several varieties of birds: budgies, kookaburras, tawny frogmouths, cockatoos, and keas. Linehan said a similar interactive aviary experience has received much positive feedback at the Franklin Park Zoo. 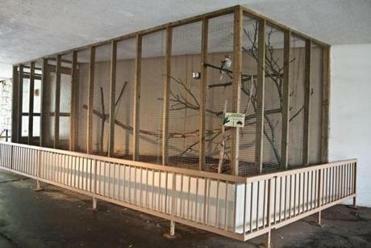 Stone Zoo also used to have a popular aviary that was torn down years ago, but the new walk-through exhibit offers the chance to once again get close to birds. The Stone Zoo, formerly known as the Middlesex Fells Zoo, opened in 1905 with a small collection of wildlife from the adjacent Fells reservation. By 1956, it had added animals from all over the world. A kookaburra bird was perched on a branch at the zoo in Stoneham. But in November 1990, citing budget constraints, state officials closed the zoo, relocating most of its 450 animals. It reopened in June 1992 with support from donors and volunteers. Aussie Adventure joins several other exhibits that have been added since the reopening, including Yukon Creek, which features the wild of the Canadian north; the exotic Windows to the Wild; Treasures of the Sierra Madre; Himalayan Highlands; the popular gibbon exhibit; and a barnyard where children can meet sheep and goats. The Australian animals will be housed indoors in the Windows to the Wild exhibit space. Guests can walk down a pathway and stop to see the animals in their zoo habitats on one side of the path. At first, Stone Zoo had sought to just bring in just koalas — a crowd favorite — for the Australian exhibit from the San Diego Zoo’s loan program. “They’ve got a special place in people’s’ hearts,” said Linehan. However, after considering the popularity of Franklin Park Zoo’s Outback Trail — which includes kangaroos, emus, and kookaburras — officials decided to expand the program to include close to 100 animals from the Land Down Under. In addition to the tawny frogmouth, budgies, and two young koalas, Thackory and Milo, the new exhibit houses cockatoos, a Bennett’s wallaby, and a kookaburra, an insect-eater whose “laugh” is partly responsible for the sounds associated with the jungle. Zookeeper Rory Dwyer said his first time working with the two male koalas has been exciting. “They are a very unusual animal, and we always love a challenge,” he said, noting that their exhibit required careful thought in perch size and placement of the food canisters that hold the eucalyptus branches. Dwyer said he has introduced himself to the animals slowly to help them transition to their new home, and he is constantly learning new things about them. He said that visitors might be surprised by the sounds the koalas make, a low, croaking growl. Linehan said the Australian exhibit is the product of a seven-month effort that involved an extensive period of seeking permits and approvals from wildlife officials. Some zoo staff also had to receive special training in San Diego in preparation for the arrival of the koalas. “Everything from spacing to handling and food,” said Linehan, who noted that the koalas require an expensive delivery twice a week of at least six varieties of eucalyptus branches, some of which they barely touch. Despite the challenges, Linehan said that being able to showcase the exhibit, especially the koalas, is well worth it because of the benefits for guests of all ages. Linehan said that he hopes the initial interest in the koalas’ appearance will lead to further knowledge about them, especially regarding the misconception that these herbivorous creatures are bears. “They’re not even closely related to bears,” he said. Linehan said that he anticipates an overall positive response to Aussie Adventure, and that he would consider bringing the exhibit back in the future.